The standard wager for a horse race, or at least that which serves as the basis to describing what the wagers pay, is $2. It is the minimum with which you can go to the window in a real, live racetrack, which is probably why. Also, when the payouts are listed on the tote board, as well as in the racebook, it is on the basis of the $2 payoff. To calculate the payout based on any set of odds, it requires a formula that is actually quite easy. All you have to do multiply the odds on a race and multiply it by two (2), then ADD two (2) and there you will have the payout that would show up on the board. Okay, let’s say that you have a horse that has gone off at 4-to-1 odds. What you would do is multiply that by two, which would get you to $8, then add $2, which represents the $2 bet, and the return on that will be $10 for every $2 that is wagered on the horse that won. As you can see, on a horse that goes off at 1/5, the payout would be $2.40 on a $2 bet. So how are these odds arrived at? Well, all of the races at a given track have a “morning line” that is posted by the track handicapper, who in effect is an oddsmaker. This generally represents what his expectation of the public action will be, combined with his opinion. But he (or she) differs from what an oddsmaker at a sportsbook might do, in that after that morning line is posted, the odds move totally based on the way the public is betting. 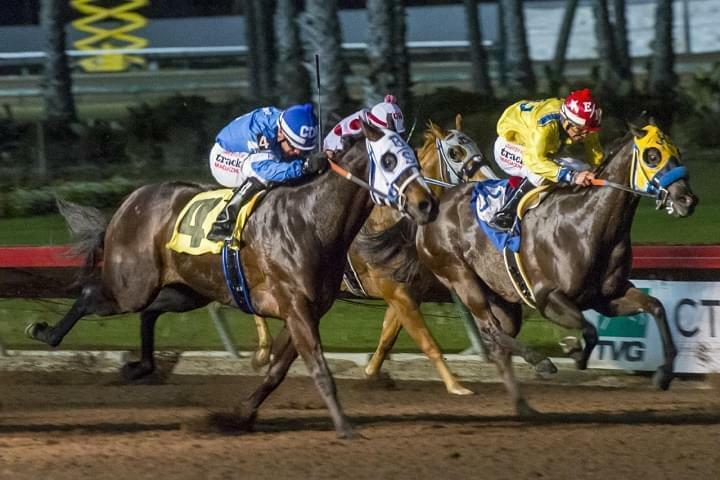 Here it is important to understand what constitutes the difference between sportsbook betting and the way betting is conducted in horse racing. Horse racing is conducted under a “pari-mutuel” system, which means that all of the wagers are put into a pool. In the normal racetrack setting, the track itself takes something off the top, as does the state in the way of taxes. Whatever remains is divided up among the bettors. Lotteries are conducted along the same lines. What this means, for the purposes of our discussion, is that when you bet on the races, you are not placing bets against the “house,” but against the other bettors. So in effect, those who are wagering are the ones who dictate who the favorites are and what the payoffs for the exotic bets become. A horse could start the day as a favorite on the morning line, but if no one bets on that horse, it is going to be going off at incredibly long odds.